So writes Lisa Seward (A Serial Flirt April 2008 Daily Mail) on the real Jane versus the Jane of the bio-pic Miss Austen Regrets. In Jane’s case the bimbo has brains too. Unless the brothers were writing the novels and did not want to be known as the authors of husband hunting drawing room dramas, Miss Austen Regrets is a film based on the letters Jane wrote to her sister and niece. The film takes us through the romantic ups and downs of Jane’s life until her death. I was braced for a corny movie but ended up enjoying a good deal: a smart and plausible script with excellent acting. I especially liked the scenes between Jane and her mother where her mother berates Jane for ruining them by not marrying and Jane reacts as only a caring yet hard headed daughter will: a stoic silence laced with guilt. Of course we don’t know if these scenes really occurred but chances are something akin to them must have for which mother won’t mutter away if her aging daughter lets a good prospect go even today not to mention especially in that day and age. I wish there had been more scenes between mother and daughter and who knows maybe someone will write a novel or pen script about the two! 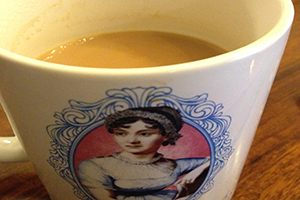 I wonder, would Austen be blogging today? What would her blog look like, or her facebook author page, and myspace page. Pink and grey? Yellow and white? Would it have stars on it or stripes? Or a cat? Many cats? A dog? Black boots and henna tattoos or flip flops and a sparkly headband? Would we even like Jane if she was flitting around today as the prettiest silliest most affected butterfly ever: remind you of anyone? Would Austen be writing what she wrote then now or would it be baby versus career and how to juggle the two if she couldn’t afford oodles of domestic help? Certainly if she was born in Pakistan she’d still be writing about women for whom marriage is the only career expected of them. If Jane was Pakistani, you can bet her mother would have made sure she married sooner or later because the typical Pakistani mother (Mrs. Bennet on acid) is an expert at guilt tripping her daughters into getting married. If you are a Janite, even if you are not, Miss Austen Regrets is a must watch.